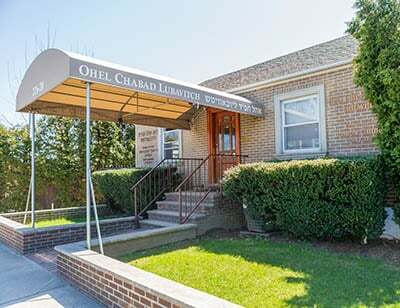 The Ohel Chabad-Lubavitch Center is located adjacent to the Rebbe's Ohel. It was established by philanthropist Rabbi Yosef Y. Gutnick of Melbourne, Australia. The Center is open 24 hours a day, six days a week. It includes a synagogue, library and a comfortable place for people to compose their letters to the Rebbe. Ohel Chabad-Lubavitch also provides prayer books, head coverings, non-leather shoes (see: Appropriate conduct) and light refreshments. The most convenient way to access the Ohel - at all times of the day or night - is through the courtyard of the Center, which has a walkway leading directly to the Ohel. People who require assistance can come to the office where someone is available to assist them. In addition there is a full time student body on the premises, who will be ready study partners. For more information, please contact the office at: (718) 723-4545 or e–mail to: info@ohelchabad.org.